This is an attractive and unusual way to serve eggs. 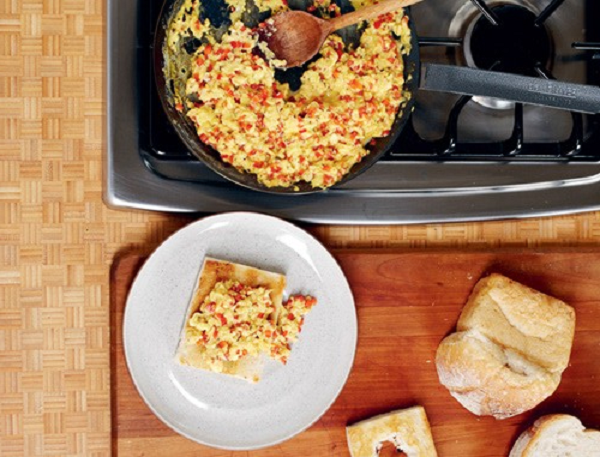 Crisp, buttery toasted bread squares serve as shells for creamy scrambled eggs. Have everything that you plan to serve with the croustades ready when you begin. You will need about half a loaf of unsliced homemade-type white bread, or you can use French bread. 2. Remove the crusts from the bread. Bit by bit tear out the center of each slice, leaving a ¾- inch wall, or a ½-inch wall if using French bread. Save the crusts and centers to make Bread Crumbs. Lightly brush the bread all over with the melted butter, and place the slices on a cookie sheet. 3. Bake for 5 minutes or until lightly golden all over. Turn off the oven and keep the hollowed-out bread warm in it. 4. In a large skillet melt 1 tablespoon of the butter over medium heat and sauté the green peppers until very tender, about 7 minutes. 5. Meanwhile, in a large bowl beat together the eggs, milk, oregano, and pepper just until blended. Don’t incorporate too much air into the eggs. 6. Reduce the heat under the skillet to low. Add the egg mixture and stir constantly until creamy and just the consistency you like for scrambled eggs. Be sure not to overcook them. Use a tablespoon to stir for the creamiest results. 7. Place a croustade on each plate and spoon equal amounts of eggs into the centers, spreading some to the edges also. Cut the remaining tablespoon of butter into bits and place on top of the eggs. Serve immediately.